This section explains how you can use OGN to track a gliding competition live. preferably an OGN-station at the airfield of the competition. You can check the OGN-coverage of your competition area using the OGN range analysis. The following sections explain how to use both tools to create a competition tracking. 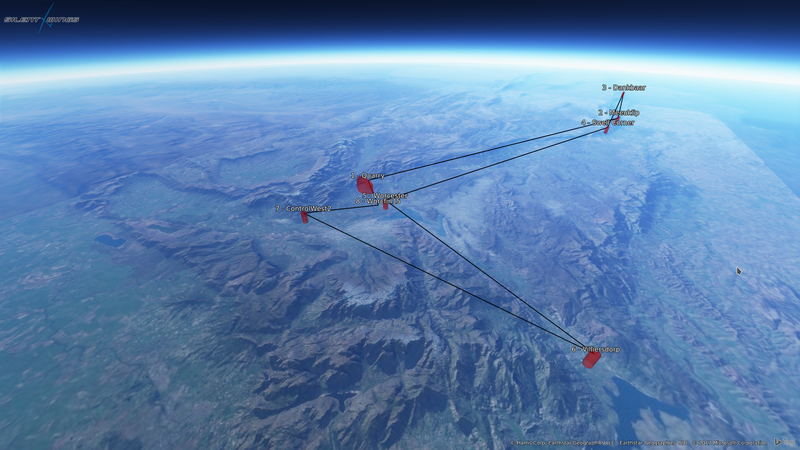 For competition tracking it is essential to integrate the task as an overlay onto the 'normal' tracking page of glidertracker.org. To do so, you need a task file acessible online via http. By clicking on the map select the turn points of the task one after another. Double clicking on the last turn point creates a finish turn point. By clicking on the turn point in the left hand menu, you can modify the type of turn point, size of turn point, etc. To only show the participants of the contest on the map overlay, you can create a filter. Onglide is a full competition management system that integrates into SoaringSpot and the OGN. The live tracking feature fetches the pilot list and task from Soaring Spot and provides speeds and distance display for both Speed and Assigned Area Tasks. Start and Finish times are automatically captured for each pilot. A track history along with vital statistics (height, height AGL, climb rates, distances, glide angles, etc) are available for each pilot. Multiple classes are supported and will be automatically downloaded from Soaring Spot. It is also possible to upload a picture for each pilot. If gliders are not registered in the DDB then it is possible to manually associate them with the competition and there is a screen to help with this during the launch process. If gliders are registered with the correct contest number then the Flarm ID will automatically be associated when the glider launches. It is not necessary to use the competition management features (online registration, landout management, self reported landouts, result display or flight statistics) to use online tracking. If you do want to use these then the hosting club or competition should take an explicit action to encourage more women into gliding. This is not required for just the tracking display though it would be appreciated. If you would like to use tracking for your competition please email ku.oc.raceulbelttil|ngo-assilem#ku.oc.raceulbelttil|ngo-assilem with the competition name, a short name (8-10 characters no spaces) for it, and the soaring spot API key & secret. If you would like to use more of the functionality please email ku.oc.raceulbelttil|ngo-assilem#ku.oc.raceulbelttil|ngo-assilem and ask! KTrax supports display of the tasks for the different classes in JSON format. Convert your tasks to JSON (using this tool: cupToOGN-Task) and upload it to a web server. Use the CGI parameter task_url in KTrax to point to the tasks. Participants can be filtered with the wlist CGI parameter in KTrax. Please see Options -> Help on KTrax for more information! This tracking solution uses commercial software: Silent Wings Studio. See SWiface and SWiface-PHP git repositories for code base of OGN to Silent Wings Studio interface. Silent Wings Studio is used in most of the Sailplane Grand Prix competitions. Look on an example Youtube video showing the capabilities of this tool. This sections compares the different tracking tools and their features. Here you can find a JAVA based CUP to OGN (JSON) task file converter.